Lee Eisenberg is. 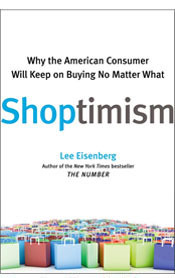 And now the former Esquire editor-in-chief and Land's End creative director has written a new book, Shoptimism, to explore how we're sold products, why we buy them, and ultimately -- in the words of the subtitle -- Why the American Consumer Will Keep on Buying No Matter What. Interestingly, even in the depths of a recession as our buying behavior has changed forever (or at least we've vowed that it has), Lee isn't rushing to condemn consumerism. Instead, he's more interested in the "is" than the "ought," and he's done everything from becoming a Target employee (briefly) to researching the neuroscience of shopping in his quest to explain both the sell and the buy. In the tradition of insightful books like Rob Walker's Buying In and Paco Underhill's Why We Buy, Lee holds up a magnifying mirror to his readers while we shop -- and ultimately reassures us that we don't look fat in that. ...or is there? It's not quite the Louis Vuitton toile, and the initials are "JN" rather than "LV." In the context of the video, it's just the sort of obvious fake that the comically less-than-appealing guy who's not Colbie's type -- but whom she's falling for anyway -- might own. We've all seen imitation goods so poorly rendered that they wouldn't fool a myopic Martian on a dark night. And there must be a market out there beyond mere video fiction, or LV look-alikes wouldn't keep showing up on shady street corners and in dark corners of the internet, next to the "Prado" and "Channel" bags. 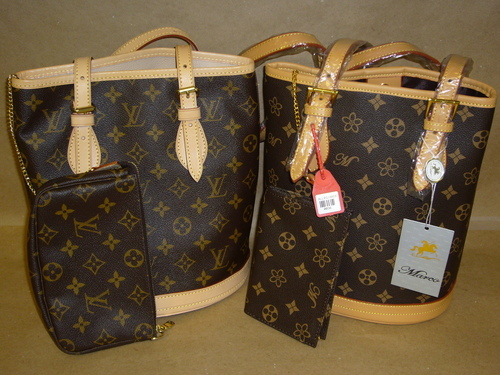 But why would any self-respecting counterfeiter turn out such bad fakes? So, Colbie, a word of advice: Don't take the plunge. He's not worth it!